Forget Mauritius, in recent years it’s Zanzibar and its surrounding islands that have emerged as the go-to location for luxury travellers looking to kick back by the Indian Ocean. But searching online for the perfect hotel can be overwhelming at first. The area isn’t short of hotels by any means. From backpacker lodges to the most high-end of boutique resorts, any visitor to the collection of paradise islands will be spoilt for choice, making it impossibly hard to decide where to plant your beach towel. Below are five of the Zanzibar Archipelago’s top luxury hotels, each located in different corners of paradise. In Pongwe, on the eastern side of the island, you’ll find the luxury 5-star hideaway of Tulia. The hotel is named after the Swahili word meaning “relax,” and the peace and tranquillity that the resort offers will make it hard not to. What sets Tulia apart is its size. The resort is small, giving it a sense of intimacy and privacy, something that the bigger resorts lack. There are also about as many hammocks as there are sun loungers in this stylish haven, so finding a secret spot to unwind with a cocktail in hand won’t be difficult. Each guest at Tulia receives a complimentary massage, but the adventure seekers might like to borrow the hotel’s paddle boards or kayaks and head out on to the crystal clear water. And after that, how about trying out one of the hotel’s water slides before enjoying a gourmet 5-course dinner served by the friendliest staff in Zanzibar? This place offers guests a pure luxury experience, without any of the pretentiousness that often comes with hotels of such high quality. Equipped with a gym, spa, mountain bikes and a volleyball court, this resort on the western side of Zanzibar certainly won’t leave guests without something to do. Fruit & Spice also has an impressive wooden jetty leading out into the ocean; the perfect spot to watch the sun go down over the horizon. The resort’s swimming pool is vast and kept immaculately clean, as are the numerous man-made beaches with sun loungers facing out onto the azure blue waters. Guests will be impressed by the high-quality buffet dishes on offer at Fruit & Spice, but there are also separate stations offering further choices. Expect fresh fish, stir fries, pasta and omelettes to be cooked right in front of you. As for the rooms, they are spacious and clean and situated close enough to the pool that guests can simply roll out of bed and onto a sun lounger in the morning. Any luxury traveller will be pleased to find Essque Zalu on the northern tip of the island. It’s a very large property with modern and stylish decoration and very spacious suites. One of the best parts of this resort is its position. With incredible views of the ocean, guests instantly feel relaxed and at peace here. The quality of the food is high, with impressive menus spanning 3 restaurants which cater for all tastes. Essque Zalu boasts a unique restaurant, called The Jetty. It’s a floating restaurant, offering a truly unique dining experience that will make any holiday a memorable one. The resort also boasts plenty of facilities to keep adults and children alike entertainment; there’s a fitness centre, a kids club and even an art gallery. 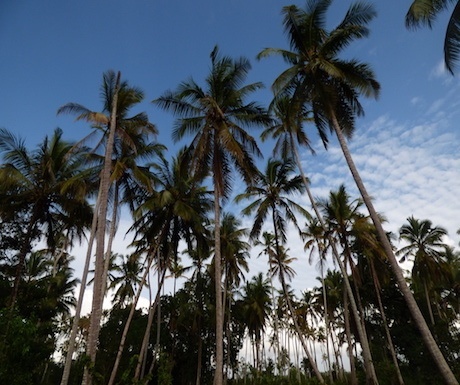 Excursions to other parts of the island can be arranged should you wish to explore what the rest of Zanzibar has to offer during your stay. Mnemba island, which can only be described as an idyllic paradise island, is just a short boat ride away from mainland Zanzibar. With only ten beachside rooms, this place is so private that guests won’t even have to see another human being until meal times. 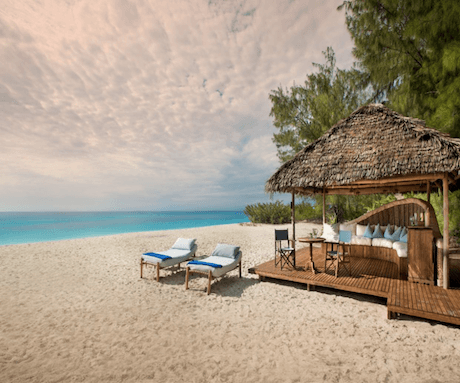 The days on Mnemba can easily be spent horizontal on a sun lounger or strolling along the pure white sandy beaches until it’s time for an evening cocktail. Scuba diving and snorkelling fanatics will not be disappointed by the coral found just a few feet from the beach. For a honeymoon to treasure forever, this place has got you covered. Pemba is yet another gem of an island situated off the coast of Tanzania, surrounded by clear blue waters. If you’re looking for a holiday which enables you to completely switch off from the real world, then The Manta Resort is the place to go. Here, guests find themselves in a truly relaxing surrounding, served by friendly staff that make each guest instantly feel at home. Combine that with fresh food and endless sunshine and the holiday is bound to be a success. This hotel has a secret weapon, though. Fancy spending a night underwater? Then, the floating room is for you. Dive off the roof into the balmy blue waters, and spend the evening watching tropical fish swim by from the comfort of your bed. Wow, those are some amazing pictures. I think you’re right, it can be overwhelming finding the perfect hotel. There are so many to choose from and it’s great to have a short list to look at. Now I’ve read this list, I think The Manta Resort on Pemba Island is making it to the very top of my must-visit destinations. An underwater floating hotel room? That’s a once in a lifetime experience – my type of travel. Do any other hotels in the world offer that? Qambani on the east coast is not just the ultimate Zanzibar coast destination, but hard to beat anywhere for out-there luxury. Worth checking out! That photograph underneath the floating room is just incredible. I think that when you go to far flung destinations, luxury is key. You are already spending a certain amount on the flight, so having luxurious accommodation just makes sense in the long run. I want to try that floating room! Interestingly I also noticed a spike in holidayers travelling to Zanzibar recently. I’m sure that a few years ago it was quite uncommon! Pemba Island really sounds like the break I need from working life, I’m going to have to check The Manta Resort out! I’m a sucker for isolated areas surrounded by crystal clear waters. The Fruit & Spice Wellness Resort looks ideal, I really want to go somewhere beautiful that has a spa to relax in. The food also sounds really good, I’ll have to check the place out. The Manta Resort floating room sounds like such a unique incredible experience, I’d love to do something like that. The floating room looks and sounds just amazing and an experience you would truly remember! I love the look of Tulia as well I can just see myself in the big chair by the pool with a cocktail. This has made me want to book a holiday to Zanzibar as soon as possible.